The last year of my life has been slightly dreamlike. I am not being over the top when I say that Flash Fiction has changed my life. It has helped me to focus on positive, creative and community projects when I was suffering deeply from grief. There are so many people that helped me with this new-found hobby and I’ll always be entirely grateful to them all. The FlashDogs movement deserves an entire post. But not now. 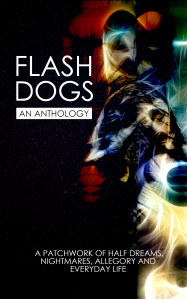 Now I have to shout (belatedly) from the rooftops that we created a piece of magic in the form of FlashDogs: An Anthology. 34 Writers. 110 Stories. 1 Charity. The EBook charted in the UK top ten for the three categories it was listed in. It charted in the US top fifty for two out of three. More importantly, it contained story after story of mind-blowing flash fiction. This took up almost all of my life over a number of months and also involved a sub-project; the secret physical book (which was only possible thanks to the incredible top secret agent work of Emily June Street and Tam Rogers). I was humbled and floored by the dedication of the book to me. I reciprocated by dedicating the physical book to Emily, Tam and David Shakes. Emily had a massive job in turning the 110 stories in different formats and styles into something that was close to a professional standard. She did this alone, with only guidance provided by me. She did a spectacular job. Tam created the stunning and mesmerising artwork for the cover and website. She also provided the prompt that generated the sublime stories. The promotional posters that got everyone excited were also her work. Shakes had the original anthology idea. I helped to bring the community together and drive the project, but it wouldn’t have happened without someone being brave enough to say “lets make this happen”. He was also incredibly supportive of the ideas I had and backed them 100%. Thank you, Sir Shakes. Kristen helped to get our website framework into shape by volunteering an expert and we’re very grateful to her partner who then made it happen. We had a wonderful gift from Natalie Bowers, who generously donated her winning prize from the crazily competitive Ether Books competition to help our cause. Thanks (again) to her, she is the embodiment of what makes us special. Many other people helped with promotion, support, buying and giving away books (you know who you are). Thank you! I had four stories published in the book (thanks to Shakes and Emily) for editing them. I won’t post them here, as we want as many copies to be sold as possible as the royalty payments will go to our chosen charity IBBY. Oh, and I probably should mention that we’re working on anthology number two! Reblogged this on emily june street.